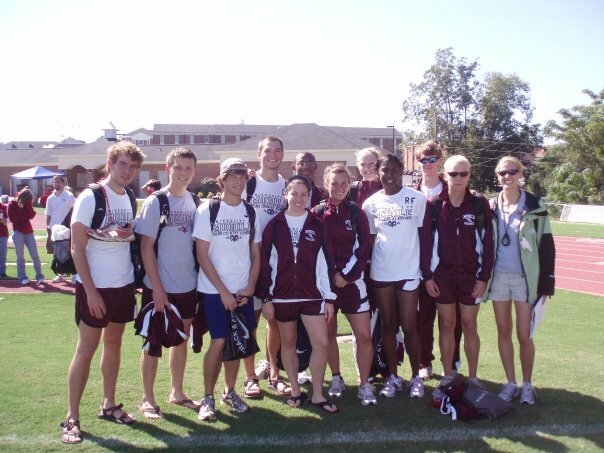 In college, I ran on the Cross Country team. (I wasn't great at it... I just ran because I loved being on a team and hanging out with friends while running at practice every day.) I loved races: the excitement, the preparation, the road trip with the team, choosing the right music to get me ready to run my best. Every race, I would lace up my obnoxious race shoes that were bright yellow and hunter green and take a short jog around the starting line. I hated these shoes. Runners who ran in obnoxious shoes were supposed to be obnoxiously faster than everyone else, and that was certainly not the case. I remember the race above well. Races were 5Ks, or 3.1 miles, and after the firing of the starting gun I was out with the front of the pack, feeling like a rockstar. (Starting in the front was not the norm for me.) I can to the first mile at about 5 and a half minutes (not a normal time for me). Our coach would always wait at each mile marker to cheer us on, but this time she did the opposite. She told me to slow down "just a little." What? Slow down? But this is a race. Only a couple more minutes and I realized exactly what she meant when I felt like my lungs were collapsing and my legs forgot what my brain was telling them to do. I had sprinted at the wrong time. I tend to be a sprinter in most of life, and like the race, have to teach myself to slow down so that I can maintain speed for the long haul. I like to do chores and clean in spurts of frenzied energy, not in consistent focus. I like for things to be done quickly and excellently (I have a relentless streak of perfectionism that I'm still attempting to banish), and yet, I also know that this can lead to losing steam, focus, or motivation if not managed carefully. Sprinting is great when you have a big deadline. It's great when you need to get all the groundwork laid for a project so that you can pass it off to someone else who is going to carry out the details. It even works when you are feeling the need to do something new and launch something big. It doesn't work when you need consistency or when the project is cyclical. Knowing when to sprint with everything that is within you and when to run hard for the long haul is unbelievably valuable in life, leadership, and employment. Learning the balance is pivotal. Sprint when you can, but don't sprint when you should be running a consistent pace. And if you are a leader or a coach, know when to ask your runners to slow down so they can make to the finish line.